A junkie sits alone in his ramshackle apartment, lit only by the glow of his smartphone screen. Unblinking, he taps and slides his finger along the screen like a panicked animal. “Squares, need squares, c’mon, just one,” he mutters to the emptiness. 100. 200. 300. “This could be the one.” It only takes 45 seconds for his heart rate to spike. Thanks to Patrick Moberg and his incredibly popular mobile game Dots, the above scene isn’t quite that far from science fiction. Just ask anybody in the depths of a 20 minute binge of connecting multi-colored dots whether they feel like an addict. As a perfect example of “making fun” with creativity and tech, I emailed back and forth with Patrick last week to get the origin story of the game that has single-handedly torpedoed my recent productivity. Who are you? What do you do? Do you have any pets? What are your pets names? What do your pets do? I’m Patrick, a hacker-in-residence at Betaworks. No pets, but I follow a bunch of dog accounts on Instagram and made this stuffed dog named Chino for my girlfriend’s birthday. He’s mostly just lounges around, but occasionally causes trouble. How did the idea for Dots strike you? The initial spark for Dots came from this artist named Yayoi Kusama. She creates amazing art with dots. It’s always been an itch I wanted to scratch, but I started thinking about it seriously in mid-January, when the hacker-in-residence program started at Betaworks. Had you ever built a game before this? I haven’t released any games before, but when I started learning how to program, I tinkered on a lot of simple game ideas. There is something very magical about seeing things come alive because of code you’ve written. I think that might be a good way to introduce people to programming. Making games touches on a lot of different math and programing concepts. So inspiration strikes you in the form of these dots, but what happened next? There could have been a million different directions to go from just colored circles. How do you think you wound up at this particular game? I started by making a bunch of designs the size of the iPhone screen that felt like “art” instead of interfaces. 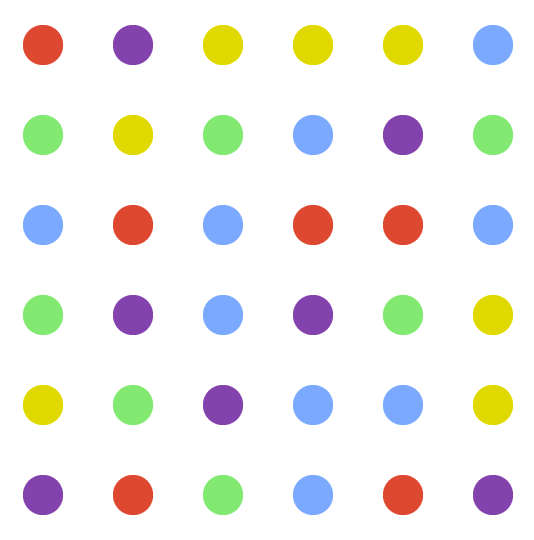 One had a grid of same sized dots and I think the OCD part of my brain wanted to group and organize them in some way. The process of figuring out the game mechanics was similar to the overall approach: small tweaks and deciding if they seem “right.” Many games optimize for trapping a user in their game so they can bleed money out of them, I just tried to make an interaction that felt enjoyable. Once you have the basic premise figured out, walk me through the process of making all the smaller decisions like design aesthetics, sound effects, powerups, and all those other things that add up to dictating the total experience. It’s was very iterative. I wanted the fewest amount of things on the screen, so I started with the dots, a score, and a timer. As soon as I had something that was playable, we had everyone at Betaworks give it a try. People would send me feedback, or grab me in the morning to tell me what they wanted in the game. I built a version of almost every idea that was suggested, played with it a bit, then decided if it was a step forward or a step back. The aesthetics were kind of influenced by old board games that still look great, and the sound design was handled by my friend’s company Upright T-Rex Music. They killed it. Name one big reason you think Dots has been so successful. Name one very small reason you think Dots has been so successful. For more on Dots, check out our guide to total dotmination so you can learn to score 500+ points and not have a social life like us!